Game Over - CHARTER SCHOOL WATCHDOG http://www.charterschoolwatchdog. Who doesn’t like a good board game -- unless of course -- you are the one losing? The United States’ tax payers have been on the losing side of the Gulenists’ game for the past 15 years. This game of “monopolizing” our federal and state tax dollars to fund an alleged terrorist organization firmly planted in United States’ charter schools is far from amusing. In fact, it’s a dangerous game of infiltration that should have been shut down from its inception, but instead -- continues to grow at an alarming rate, with no end in sight. In this game, the Gulenists roll the dice and buy United States’ legislators with free trips to Turkey and campaign contributions, allowing them to pass “go,” collect more cash and H1-B visa employees, and money launder hordes of illegal funds obtained through its endless charter school schemes. 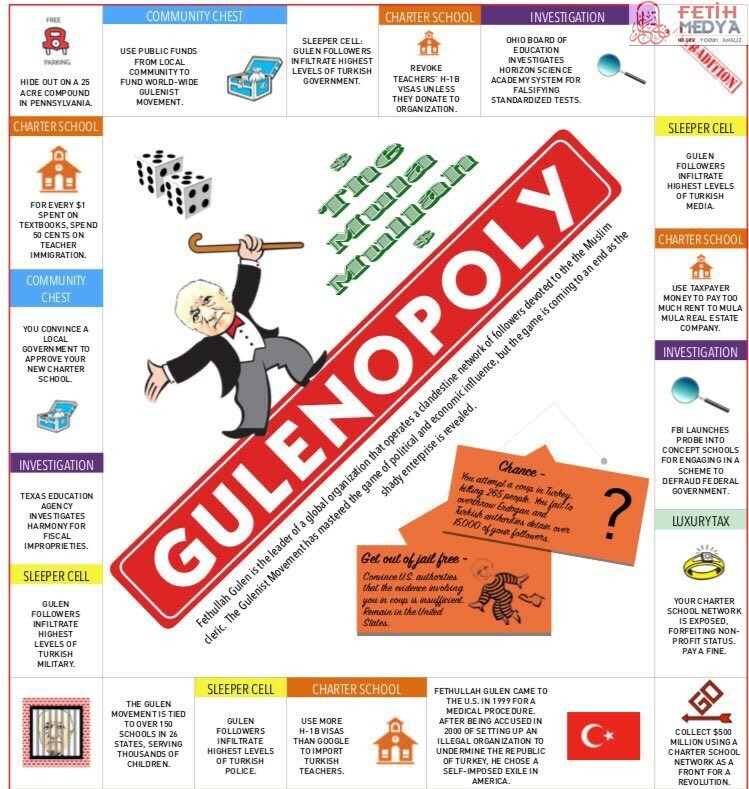 Likewise, this version of the game hands out countless “get out of jail free” cards ensuring that Gulen and his cronies remain untouched by both United States and Turkish authorities. The Gulenists began their game of “buy up American charter schools,” with George W. Bush, and continues to flourish under the Obama administration (including picking up the $30 million “Race to the Top” grant card). Despite an ongoing federal investigation into these schools, coupled with Turkey’s demand to extradite Gulen for alleged terrorist acts, the Gulenists are still winning the game against the United States. Instead of building a fence to keep “illegal aliens,” out of the United States, soon to be President Trump should look more closely at the “illegal” activities of the Gulenists who are currently residing in the United States, a religious cult and political faction of “undesirables” who demonstrate a clear and present danger. It’s time for the United States to stop rolling the dice -- and instead -- force Gulen and his followers to forfeit their “get out of jail free” cards. Prosecute the Gulenist criminals and send Gulen back to Turkey. Original graphic provided by: Denny Rehberg, the former Lieutenant Governor of Montana and U.S. Representative incorporated in an article for U.S. daily The Hill.